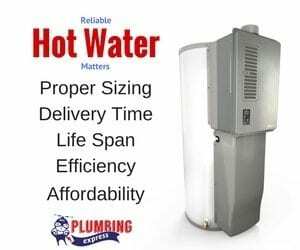 We offer excellent water heating options. Service and good value to our clients. At Plumbing Express we offer the latest Rinnai tankless technology and the most reliable Rheem Tank Heaters. We are a Georgia-based & locally owned company who cares about our neighbors and community. Our company is lead by home service experts and our team members are factory trained. We supply and install the best water heaters and we back that equipment up with a Plumbing Express labor warranty.